I Got a New Job Out of State. Can I Move With the Children? Home » The Law & You » I’m Divorced and Got a New Job Out of State. Can I Move With the Children? I’m Divorced and Got a New Job Out of State. Can I Move With the Children? If you got a job in a different state, is it possible to move with your children? That’s what one recently divorced viewer wants to know. 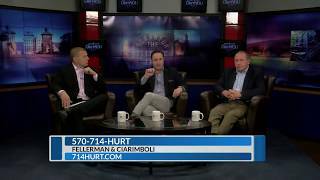 Attorneys Greg Fellerman and Ed Ciarimboli offer some legal advice. Dave Kuharchik: Time now to talk about divorce on this edition of “The Law & You.” Our favorite attorneys are back. They are attorneys Greg Fellerman and Ed Ciarimboli. Ed Ciarimboli: We better be your favorite attorneys. Dave: Of course you are. All right, here’s our question tonight and let’s get to it. We’re talking to Lisa from Avoca here, she says, “My husband and I just got a divorce. I got a very good job offer in North Carolina. Is it possible to move there with my children?” What does Lisa have to consider? Ed: Lisa, it’s a very complicated answer to this particular question. Obviously, your children have roots here, they’re in the school system here. Just because you got a very good job offer in another state doesn’t necessarily mean the court is going to allow you to bring your children with you. There are a number of different factors the court is going to look to. Mainly, what is in the best interest of your children. Just because you got a very good job offer, that’s not going to be the end all be all answer to this particular question. Greg Fellerman: At the end of the day, the best interest of the children is what’s going to prevail. What the best interest of the children in this situation is they have time with their biological father regardless of your job offer. So, I think you’re going to have a really difficult time, especially if the father strenuously objects to that and says, “Hey look, I don’t want that to happen, I don’t want my kids to go out of this jurisdiction.” I think it becomes a lot harder for you to do that. Again, the best interest is both biological parents are involved with their children. That’s what the courts want. Dave: And I know family law is not your thing so if you need to talk to the attorneys, you guys will get some good referrals? Ed: Absolutely. You need a lawyer to handle this particular situation. Dave: Great advice. The number, the website are on your screen. Remeber, results matter with attorneys Greg Fellerman and Ed Ciarimboli. Guys, thank so much.